This is the second painting in my twin series. My childhood keeps seeping into these. If you didn't guess, I'm the one that wore glasses. 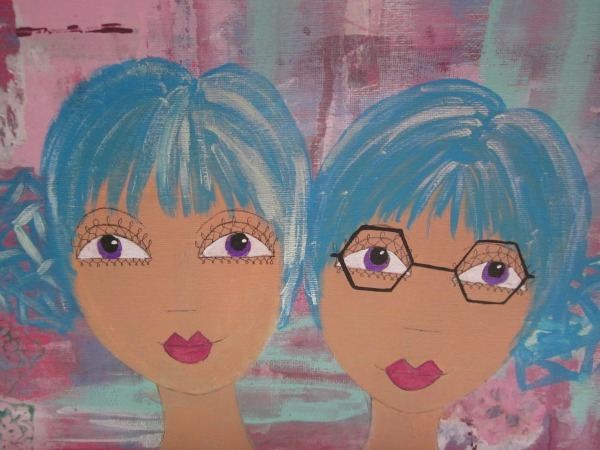 Growing up, I never could figure how we could be twins but I was the only one needing specs. In middle school I happily discovered contacts and all was well with the world, haha. Did you ever have to wear glasses or some other contraption when your siblings or friends didn't? P.S. Today's my son's birthday, he's twelve. Happy Birthday little man! Well I think the twin with glasses looks lovely and intelligent! I like my glasses. I think they hide a lot of things better left unexposed! The painting is delightful! HPPF. Happy BDay to your son, and Happy PPF to you. I love the quirky feel of your painting. Lovely painting, cute couple with or without glasses! I have a twin brother, so I was never surprised about the differences...;) Happy PPF and Happy Birthday to you and your son! I love this - those glasses are super funky! Happy birthday to your son! Glad you like them. 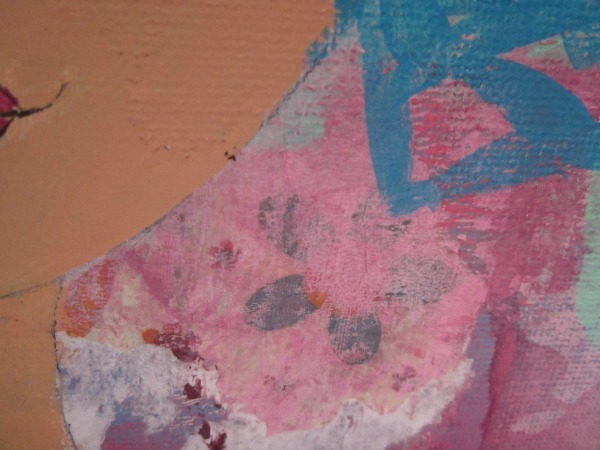 It took me awhile to figure out what shape would go with a whimsical painting. I think ovals would work too. May try one fifties/sixties style. So cute....I had those glasses too!! Good job...a very fun painting!! Did you? Haha. They'll probably be back around soon. As an Optician - I love this!!!! ahhhh, yes, contacts - then I had Lasik - even better! That is an interesting thought - I would have assumed both of you would need glasses! Great picture. Fun! I love this ~ how fun to have a twin sister. Even one with perfect vision! Really love your blue hair. Yes it is. :) Thanks, Magpie! I had to start wearing glasses when I was in third grade. I walked around that first day literally holding a hand up to the side of my face, trying to hide the glasses from view! I had LASIK about four years ago though and it was one of the best things I've ever done. I sitll have dreams about having blurry vision, and it's such a wonderful thing to wake up from the dream and not have to fumble around for my glasses. I missed your interview from last week but just read it now. I loved it! So exciting that your painted guitar was on tv! Happy birthday to your son, and have a wonderful weekend, Catherine. I find it fascinating that you dream in blurry vision. I guess it would be part of your vision memory. I need LASIK. :) Thanks, Sadee! very cute, love the way you draw the squiggles around the eyes! 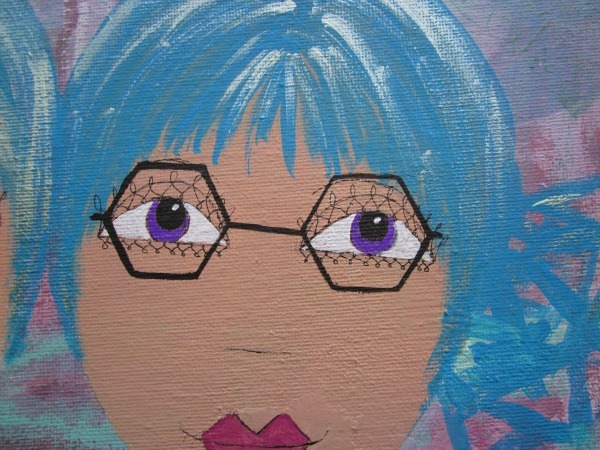 Love this painting...especially the blue hair and the geometric glasses! Wish I could wear blue hair, just don't think it'd look the same on me. :) Thanks, Mary! what a fun piece! She looks pretty cute & happy in spite of the glasses! octagonal glasses are fun though ---- my brother is 2 years older than me. In a bizarre twist of fate, we both needed glasses the very same year, when I was 12 and him 14. How does that happen? awww this is soooo cute! :) I love the way you did the eyelashes, such a pretty detail! Later on I ended up with glasses for a while. Your twin series are so cute! I didn't know you were a twin. Congrats to your son!!! happy Cake-Day! The idea of him wearing them and you breaking them made me laugh! Happy Birthday to your son!! I need glasses and my siblings don't, but I didn't really mind. I was grateful for no more piercing headaches, though I was a bit older. Love her eyelashes!! Oh wow, I'm glad it helped your headaches. I didn't get to that point but think I might've if it'd gone on too long. This is great, such cute girls! Brings back memories of my sister and I. How about being the one that needed to wear braces, but didn't need to wear a bra...that's a lot to live down. Happiest birthday wishes to your son :) I love the painting! I had to get braces when I was a freshman in high school -- Horrifying! Yes, simply horrendous! ;) Thanks Katie. very cute! As always, love the eyelashes!!! Happy birthday to your birthday boy! 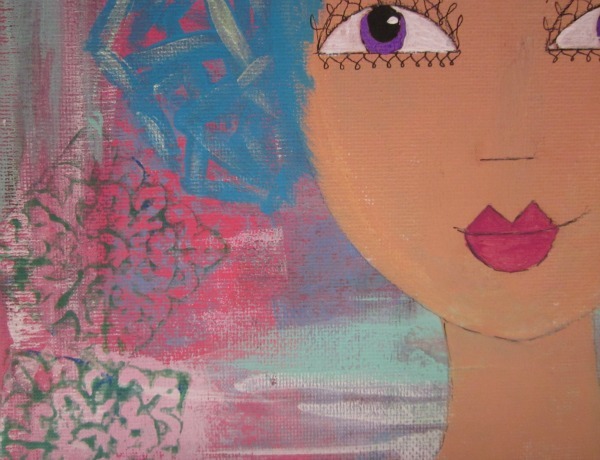 I love how you painted from your own life experiences.This is so wonderful!